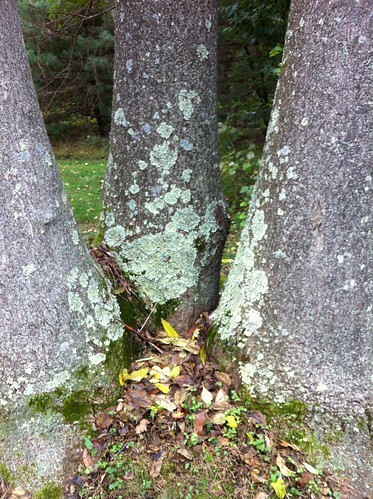 No, I won’t ever get tired on the punny lichen/liken joke. Also: I’m pretty sure my capitalization of plant/fungus names is off/wrong. Forgive me. 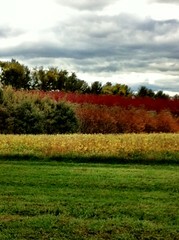 On the right we have their south west(ish) view of an orchard that cleverly hides route 7. 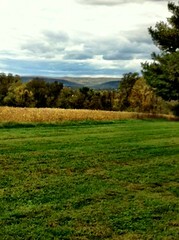 On the left, their north-northwest view towards Charlestown, WV, where route 9 is cleverly hidden by trees and valleys. I don’t know why it took me so long to get out to Connie’s – being there really reminds me of Vermont (aka home/where I grew up – at least I’m currently living in another state that starts with the letter V). She had a lot of lichen, mushrooms, and berries that we collected – yup, she even helped me with that even though it was about 55 and the wind was blowing. First, there were the mushrooms, turkey tail mushrooms and what I’m pretty sure were oyster mushrooms (not pictured because if I took a picture with my phone, I can’t find it). 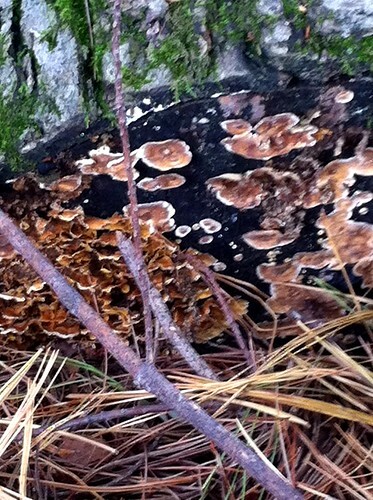 Both of these fungi are edible and I admit, I felt a little guilty putting them in the dye pot. But I’m still not a huge fan of mushrooms and got over it pretty quickly, particularly since the oyster mushroom was a little buggy by the time I got to it a few days later. 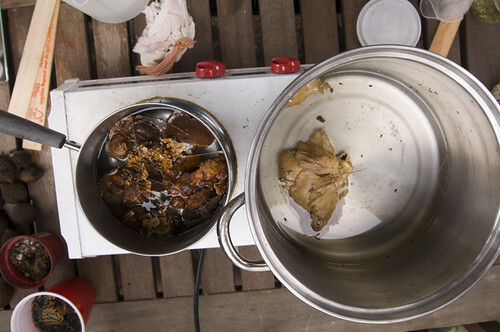 Left to right, top to bottom: turkey tail on alum-mordanted wool, the same on iron-mordanted wool; oyster mushroom on alum-mordanted wool, the same on iron-mordanted wool. The turkey tail samples are kind of blah (khaki greenish brownish yellow) but the iron-mordanted oyster mushroom sample is a deep warm brown. 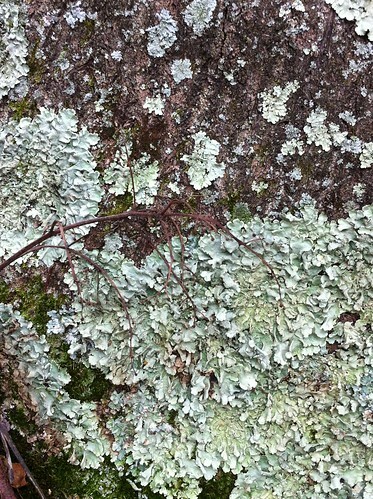 Lichen is super cool and it’s been a long time since I’ve seen this much of it growing in one spot; I had a moss & lichen collection when I was a kid and it still fascinates me. See? It fills a little over half of this lovely jar that formerly housed kimchi. 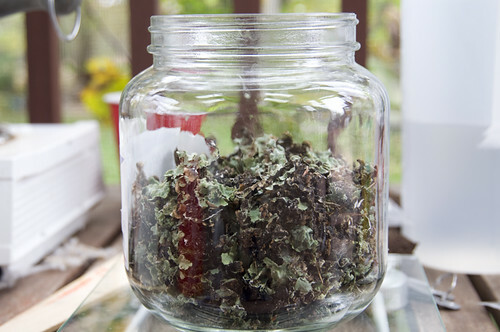 Below, the same lichen in the same jar with ammonia and water added seconds before this photo was taken. Seconds after that, it was a little too murky to see through. The last two things that Connie and I collected were bittersweet berries and pokeberries, neither of which are great dye plants, as it turns out. The pokeberry looks really promising, especially since it stained my fingers magenta. It does give color, but the color is fugitive, meaning once sunlight hits it or enough time passes, the color fades to gray or, in some cases, brown. The color you see isn’t necessarily the dye color that shows up on textiles; I’m not quite ready to explain the chemistry behind this because I don’t fully understand it myself yet and while I’ve poked around for an explanation, I haven’t found a good one yet. Pokeberry has been used in the past on items that would likely not be in direct sunlight or on items that could (and would be) re-dyed. 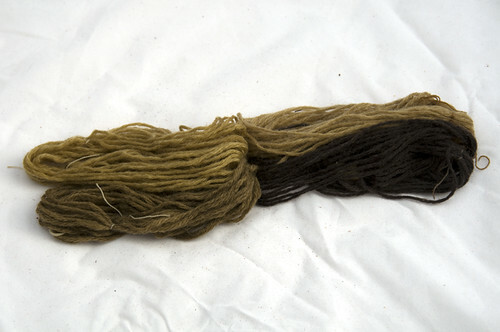 Over-dying or re-dying garments was actually quite common before chemical dyes and was looked on as part of garment care. 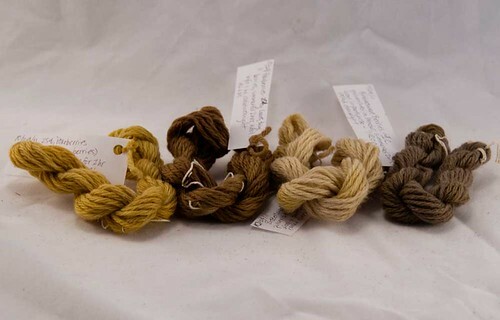 Some natural dye sources (like cochineal and indigo) last longer than other and were, of course, more valuable. For more natural dye history, read A Perfect Red: Empire, Espionage, and the Quest for the Color of Desire; it’s on my to-read list, which is becoming insurmountable at this point. The other berry we collected was from bittersweet vines, a touchy subject for gardeners and tree-lovers. There is American bittersweet and oriental bittersweet. Guess which one is the bad guy? Yes, it’s the oriental bittersweet. It’s non-native, invasive, and strangles the host tree. American bittersweet is apparently more demure, not strangling it’s host or growing in thickets, but it hybridizes with the non-native to produce vines with the worst qualities of oriental bittersweet (tree stranglers!). I don’t know how to tell difference between American bittersweet and oriental bittersweet, other than a slight variation in berry color or size and the happiness or strangulation of nearby/supporting trees. For my purposes, it really doesn’t matter since all of my research primed me for dye disappointment anyway. So. The berries were the last thing I tackled because I kept hoping for some magic that would assure me our effort to collect them had been worth it. 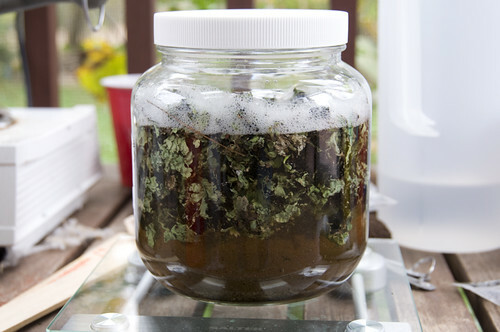 I used my standard procedure on the pokeberry berries, leaves, and stems – I weighed the dyestuffs (254g), brought it up to a simmer in water, simmered for about an hour (probably more), added my soaked yarn samples, simmered more, cooled over night. I did almost the same with the bittersweet except that Connie and I only collected berries (about a cup full). I also commandeered our extra blender (which I later used to chop up the madder) to pulverize the berries (which are poisonous if ingested, along with the rest of the plant), thinking that if there was color to release, this would speed things along, which is generally true. Instead of straining the dyestuffs out, which I was reluctant to do with the bittersweet in case there was some freak accident and I swallowed some of the dye brew, I put my yarn samples in netting. Checking the color of the bittersweet samples was near impossible without rinsing, so I left the sample in overnight. Left to right: pokeberry & crape myrtle on alum, same on iron; bittersweet berries on alum, same on iron. The pokeberry-crape myrtle skeins are the most interesting, but I think most of that color is from the tannin in the crape myrtle bark, not the pokeberries. I had a great afternoon with Connie and learned a lot from these experiments, primarily that I need to bring dye books with me or have a specific material in mind before I waste time & effort & natural resources trying something out.